Introduction Create your own Gold Medal - The London 2012 Olympics has been the topic of conversation for the past few weeks as we all see and hear about those talented sports men and women, with over 70 countries receiving medals. 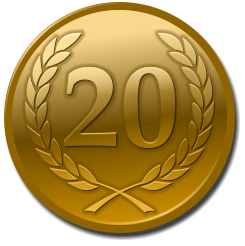 See how easy it is to create your own gold medal graphic using Xara Photo and Graphic Designer. Perhaps for use on certificates to be awarded to your club or school sports boys and girls or for your training and other awards certificates, or even for your website. In this tutorial you will learn techniques to create three point graduated fills, highlights, cutting out shapes, embossed effects, drop shadows, glow shadows and more. If you don't have Xara Photo & Graphic Designer you can download a free trial version to follow this tutorial. Photo & Graphic Designer includes plenty of elements and clipart but we have created some new ones to help you create your gold medal. You can download the designs here and unzip them to a folder on your computer. So, now let’s start the tutorial!